Ask any runner, and I bet you’ll get a general consensus – whenever you CAN’T or SHOULDN’T run (read: injured/resting/recovering) it is when you WANT to run the most! Here, 8 days post-Chicago, I am ITCHING to run…bad. Sure, on Saturday I did run/walk training with the No Boundaries Group at Fleet Feet, but I am not counting that 😉 Since I began training with the Hanson Marathon Method, I’ve been a stickler to the recovery period after 26.2, but as I transition into a new schedule, I came up with an idea that I think will benefit not just me and my antsy-ness, but the greater good!! So, yes – you may have heard of a matching challenge before – where someone donates an amount, and then some wealthy donor goes in to match it, essentially doubling your money. 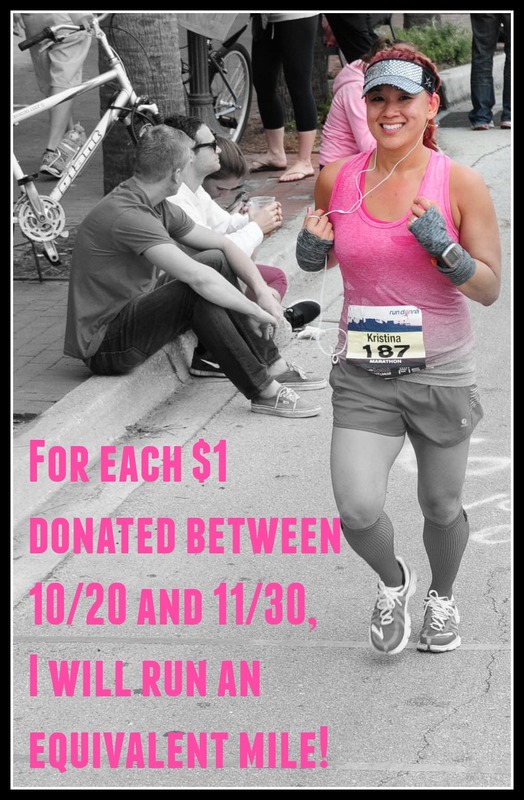 Well, I am still working on finding a wealthy donor or two, but in the meantime, I am doing what I do best – running – and matching each dollar to support the cause and prepare for all the running fun ahead this season. DONATE TODAY – and I’ll be lacing up my shoes and hitting the road! How many miles do you run a month? How many miles do you think I’ll reach in the next 40 days? I worry about you over training with this – but you know your body so go for it. I finally hit 3 months of 100+ with marathon training for Detroit. Now, I’m feeling pretty good muscle-wise 2 days after but I feel like I have pneumonia. Can’t breathe for crap. Makes no sense. You’re on the hook for 10 miles for me 🙂 If the stars align, I still want to make it down to Jax to run the half with you guys. Bari – that is a problem I would LOVE to have! !